A salad like this is a perfect ending to a cheery day. It hits all the right notes — crisp, crunchy, sweet, savory and belly-filling. And despite the length of the ingredients list, it’s ready in 10 minutes or less. An invaluable recipe to have in your repertoire, right? This healthful salad was actually the ultimate finish to my Friday, the last weekday of spring break for my kids. We’d had a playful day filled with laughter, thrills and our collective favorite place — the beach. Yes, again. What really made it significant though was that the whole week had been filled with memory-making good times. That’s no small feat, considering it was a work week for me. It was as though I had a fundamental shift in thinking that allowed me to just let go and enjoy — while still keeping up with all my work responsibilities. Good times, people. But I will be the first to admit that the merriment of Spring Break 2012 is a complete 180 from previous years. In the past, the words ‘spring break’ have made me shudder. I struggled to balance work with having the kids home, and never seemed to do it well. Instead of enjoying spring break, the inevitable disruption in our schedule was an overwhelming challenge. And then there were all my good intentions of being one of those families that actually traveled during spring break. It never happened, a reality that inevitably produced dreaded feelings of inadequacy. Spring break in past years was just a bundle of blech. This year was different. Anticipating the start of spring break, I was excited for the welcome respite. We’ve been in a whirlwind of activity for the past few months, including the week we were away. The beautiful weather and not wanting to travel (yes, really) made a difference too. You know what else made a difference? Being a little spontaneous. Little excursions — to the playground, to the beach (um, twice) and even to track practice with friends — made the week really count. The little things can really mean so much. So spring break this year? It was awesome. Summer vacation can’t come fast enough now. While I can’t fast-forward through the last two months of school (and really, I wouldn’t want to … there is something to be said for anticipation), I can clutch a tiny bit of summer by trading the heavy foods of winter for the lighter bites of summertime — like this Edamame Chicken Dinner Salad. 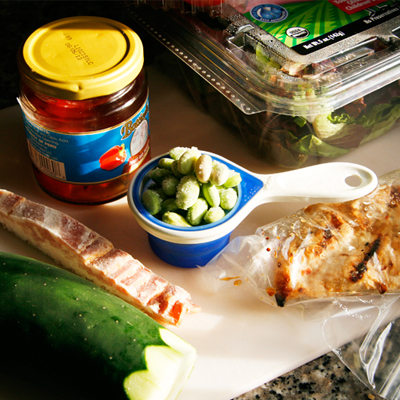 A little more about the salad … This is crazy simple to make. Start with a bed of lettuce. Top with cucumber, tomatoes and roasted red peppers. Fry up a slice of bacon (yes, just one) and then brown edamame in the grease (ok … that I could have made a little healthier, but everything in moderation, right?). Top the salad with the bacon (crumbled, of course), edamame, a sliced grilled chicken breast (perhaps leftover from last night?) and a little oil and great quality balsamic vinegar. Oh, and a touch of salt and pepper. Done. Grab your fork and dig in. It’s calling to you. Seriously. So tell me … how do you feel about spring break? Is it something to look forward to, or a total dread fest? Arrange the lettuce, cucumbers, tomatoes and roasted red peppers in a large bowl. Heat a small skillet on the stove over medium heat. Add the bacon and cook till crisp. Remove the bacon to a paper towel lined plate and let cool. Add the edamame to the skillet and cook, shaking the pan occasionally for 3-4 minutes, until lightly browned. Crumble the bacon onto the salad. 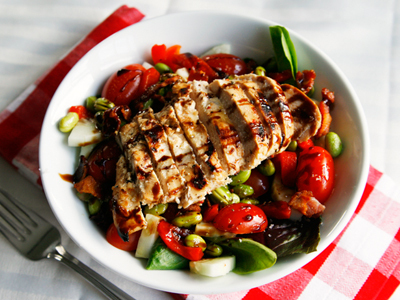 Top with edamame and chicken breast (hot or cold, it's your choice). Drizzle with olive oil and balsamic vinegar. Then sprinkle with salt and pepper. I could definitely go for a nice dinner salad! Your salad looks devine! So brilliant. Very true. Does school where you are follow the same fall-winter-spring schedule it does here with summers off? Our spring break was a few weeks ago, and awesome. Glad to hear yours was as well! Definitely our best ever, Cate! My kids aren’t old enough to be in school yet, so I haven’t had to worry about spring break yet. I guess we’ll see how I handle it in a few years! This salad sounds amazing. The perfect ending to a day! Thank you! I think this is the first year that spring break matched up to what I envisioned it being like when they were babies. I really love dinner salad. 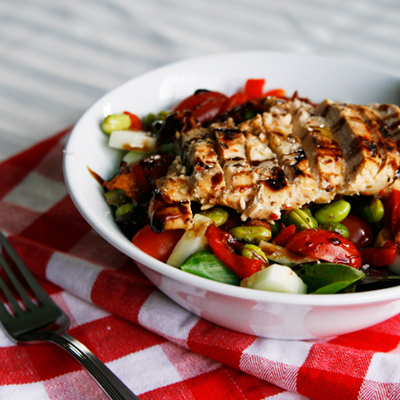 Thanks for the recipe you have given of the Edamame chicken salad this is very delicious. I am liking the sound of this salad!